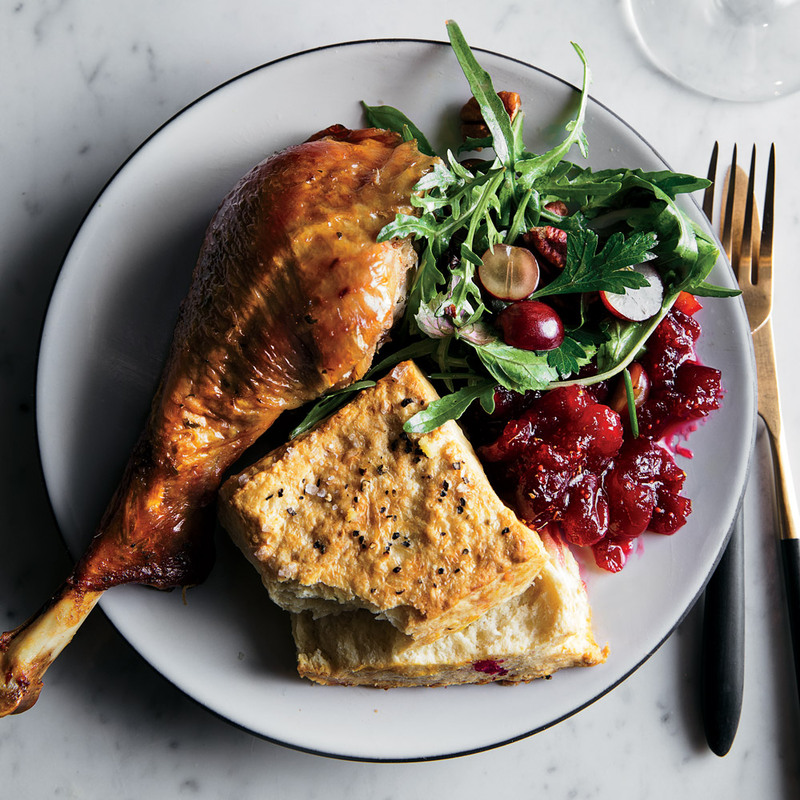 When Top Chef winner Kristen Kish took over the responsibility of cooking Thanksgiving dinner, she gave her brother the job of roasting the turkey. This recipe, which she taught him, uses cider vinegar as the brine, which tenderizes it and yields flavorful drippings perfect for pan jus. Stir together 2 gallons warm water, vinegar, salt, brown sugar, peppercorns, bay leaves, and parsley stems in a 14-quart stockpot until sugar and salt dissolve, about 1 minute and 30 seconds. Let brine cool to room temperature, about 30 minutes. Place turkey in brine, cover, and refrigerate 12 to 24 hours. Remove turkey from brine; discard brine. Pat turkey dry with paper towels. Preheat oven to 350°F. Stir together butter, parsley, thyme, lemon zest, 1 1/2 teaspoons salt, and 1 teaspoon pepper in a medium bowl until combined. Using your fingers, loosen and lift skin from turkey breast and thighs without totally detaching skin; spread some of the butter mixture under skin. Carefully replace skin, and spread remaining butter mixture over skin of breast and thighs. Drizzle turkey with 2 tablespoons oil, and sprinkle with remaining 1/2 teaspoon salt and remaining 1/2 teaspoon pepper. Place turkey, breast side up, on a wire rack in a roasting pan. Toss together carrots, celery, onion, and remaining 1/4 cup oil in a large bowl; scatter vegetable mixture around turkey in roasting pan. Stuff turkey cavity with lemon halves, dried mushrooms, shallots, garlic, rosemary, sage, and marjoram. Tie legs together with kitchen twine; tuck wing tips under. Roast turkey in preheated oven until golden brown and an instant-read thermometer inserted in thickest part of thigh registers 155°F, about 2 hours. Transfer turkey to a carving board; remove rack from roasting pan. Let turkey rest until thermometer registers 165°F, about 30 minutes. Scoop out herb-and-mushroom mixture from inside of turkey, and add to roasting pan with vegetables. Set roasting pan on stovetop over medium-high; stir in 2 cups water, and simmer, scraping up browned bits from bottom of pan, 10 minutes. Remove from heat. Pour mixture through a fine wire-mesh strainer over a bowl; discard solids. Carve turkey, and serve with gravy.